Clemson University officially opened its new $55 million football operations center in February 2017. The 145,000 sq. ft. complex is the largest and most programmatically inclusive football-specific training facility in the nation. The state-of-the-art building connects the indoor practice facility and outdoor practice fields, consolidating football operations into one complex. Designed to support the day-to-day activities of players, coaches and staff, the new Allen N. Reeves Football Operations Complex further elevates the Tigers’ football program, and promotes the recruitment, training and development of student-athletes. 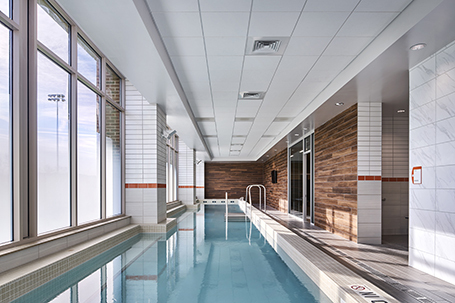 Functioning as a home away from home for many of the athletes, the complex offers amenities that allow the student-athletes to train, study and unwind in one place. 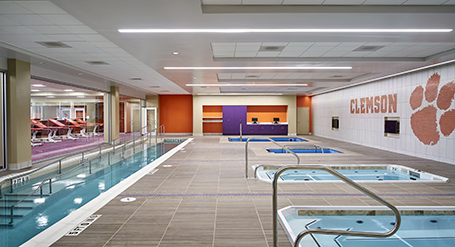 Features include outdoor leisure and entertainment space, state-of-the-art hydrotherapy, a steam and recovery room, and a Gatorade fuel bar.